Wearing guernsey #18 in the seniors, but also 19 (1948) and No. 38 (1952) at the lower levels, Thynne played 15 games for Carlton commencing in Season 1949, kicking 5 goals for the Blues. 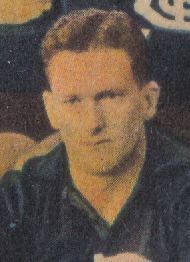 Thynne was a member of the reserves premiership team in 1951. Thynne headed off to VFA club Camberwell at the end of the season to play for the Cobras for the 1952 season. Thynne was recruited from Carlton District. He passed away on the 9th June, 1971 aged 42. 1951 - Reserves Best Clubman Award. Contributors to this page: Bombasheldon , pblue , tmd1 , p(12)terg , molsey , dgreen2 and admin . Page last modified on Saturday 01 of June, 2013 21:26:34 AEST by Bombasheldon. 1995 GF - Andrew McKay.